As we age, our skin goes through a number of changes. Collagen production slows, causing skin to thin and sag as volume is depleted. Liver spots caused from years of sun exposure begin to develop on the face and body. Enlarged pores emerge and uneven skin texture is more prominent. Declining skin tone and texture is not always possible to avoid. However, you can treat these common problems with the right treatment combination. Limelight, coupled with Laser Genesis, has been found to improve skin tone and texture for a healthier, more youthful complexion. Learn more about this beneficial treatment duo and how it can help you achieve more beautiful skin. What Is Limelight and How Does It Work? Limelight is a US FDA-cleared non-invasive treatment in removing pigmentation. The anti-aging treatment is designed to treat a range of skin issues, such as redness, age spots, and tiny veins. This is accomplished by delivering an “intelligent” pulses of light customized and safe to your unique skin tone. Limelight can be successfully used on nearly any part of your face, neck, or decollete. One to three treatments, each taking less than one hour, are typically needed to see satisfactory results. It’s normal to see some redness or swelling after the procedure. These minor side effects will usually subside in a few hours or days. The results of Limelight are gradual yet natural. After treatment, brown spots on the skin will begin to darken. It generally takes three to five days for these dark spots to scab and fall off. Over time, any redness on the skin will begin to improve. Keep the skin protected with a broad spectrum sunscreen like Oil-Free Sun Protection SPF 30 by Dr. Sylvia Skin Care to help prevent the formation of new pigmentation on face and body. What Is Laser Genesis and How Does It Work? Laser Genesis is a US FDA approved treatment which reduces redness and inflammation and helps heal potential scarring from acne. This treatment also reduces wrinkles, enlarged pores, skin redness and works to improve the texture of your skin by stimulating collagen growth and promoting skin healing with repeated treatments. During the procedure, a specialized handpiece is slowly moved back and forth over the targeted area. As it moves, the device warms the top layers of the skin. Within three to four weeks following the treatment, new cells are produced and reach the surface layer of skin. Over time, the body’s natural collagen production will continue to increase. The procedure typically takes at least 45 minutes and at least five sessions are recommended to see optimal results. There is no downtime after a Laser Genesis treatment so you can go back to your regular activities. Combining Limelight and Laser Genesis may be the secret to treating a wide range of common skin conditions. This combination therapy combines the strength of a light-based procedure with a laser-based procedure in order to address problems right at the skin surface including mottled complexion, freckles, sun damage, and even fine lines. Whether you’re looking to use it as a pigmentation treatment, acne treatment, large pores treatment, or for any other skin issue, you’re likely to find the results you’re looking for in as little as a few weeks. 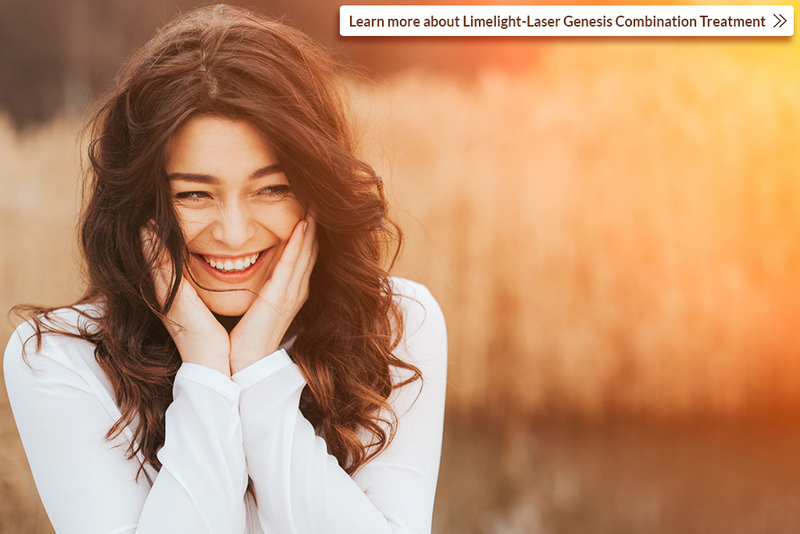 Want to learn more about Limelight or Laser Genesis? Call the Cutis Laser Clinics in Singapore today to schedule a consultation with our aesthetic doctor, Dr. Sylvia Ramirez, wherein she will develop a customized treatment plan suitable for your needs and concerns.